Hi! Thanks for following Everyone deServes to Learn. 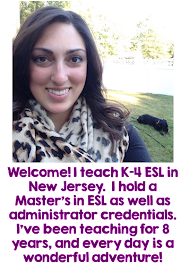 I'm an ESL teacher in New Jersey, and I love what I do. I teach K-8 in a small district, and am responsible for guided reading and writing across the curriculum. I also oversee our department and any changes we make to programs and policies affecting ELL's. I didn't start my teaching career in ESL, but I am so glad I found my way here. I come home with a smile on my face and a story to tell every day. I hope you can find something interesting or enlightening here- leave me a comment with a question and I will try to get back to you as soon as I can. I am a PreK-3 teacher in a Chicago suburb. I started as a 1st grade teacher in the district, but I was hired this week as the new ELL teacher. I will serve 2 buildings in our district. I really want to go beyond what has been done in the past. What are your suggestions? Thanks for your question! The first thing to do would be to find out your students' demographics and proficiency levels. Illinois is a part of WIDA, so your kids will have taken the ACCESS test- their scores will give you a range of their listening, reading, writing, and speaking proficiencies. From there, go about designing lessons using what your kids need the most, whichever of the four domains it is, keeping CCSS and WIDA in mind. Kids' needs come first in ESL- not the standards or the latest "trends." Good luck! Hi Maria, I just came across your site and it is very helpful. I teach middle school ESL in PA. I'm getting my first student who speaks NO English this fall. I'm at a loss for where to begin and progress. What are goals and objectives for the first marking period and how to help her learn the MOST. Can you tell that I'm overwhelmed and stressed???? Are there any websites that you could recommend? I'm looking for classroom routines and I guess a scope and sequence. Thanks so much! Great question, and good luck with your student this year. The first thing to find out is what language she speaks. If she speaks a language that uses the same/similar alphabet as English, you'll have a much easier time. I'd recommend starting with basic greetings and letter/sound correspondance, and from there, treating it like a general second language acquisition- colors, numbers, months, seasons, etc. However, if your student uses a different alphabet, you'll have to spend a lot more time on phonics and sounds- there are lots of apps and programs out there that you'll have to try to see what works. Check out Dave's ESL Cafe and Everything ESL.net for a taste of what you can do. Small group routines really work the best- if you can do something like Daily 5 and make her centers tailored to her progress, that will really help you out. Best of luck! I don't teach ESL but I am a Jersey girl, like you! Just wanted to stop by and say hi! I found you through the State Link up at Fifth in the Middle. I am also a Jersey girl! I don't have my own classroom yet since I graduated 2013. I have a BA in ECED and currently pursing my ESL cert. I am leaving Aug 2014 to teach English in South Korea and was wondering what you recommend to teach like theme units or what I should teach first. Any advice would be great!. I would so love to volunteer in your room before I go if I knew sooner. Hi Nancy! I would wait to see what level of proficiency your students are on before deciding what themes to teach. Children's books are always great to use, since you can incorporate language and content knowledge. I'd bring along a few of my favorites! Hey Kristen! Thanks so much for the sweet comments. Let me know if you have any questions about starting a blog, but the pictures are definitely the best part! We <3 <3 <3 the mini office, or as my kids say, "our blue books!" Hi Maria! My name's Michelle and I am an ESL teacher in New York. I'm so happy to find another ESL teacher! How many students will you see this year? Do you use a pullout our pushin model or both? I am so curious about how other teachers and states work their ESL programs since I've only ever taught in one district. Hello I am an ESL teacher in North Carolina, I would love to get in touch with you!! I am so happy to have finally found an ESL blog!!!! Hi! I am new to ESL in Colorado. I will have a very similar population as you, and I am getting excited about this change while reading your blog! How do you introduce yourself to the parents? Do you write a letter (and have it translated), or just meet them at open house? Thank you so much for writing this blog and giving great advice! Hi Mindy! I love finding teachers who share my population- it is a rewarding challenge for sure! We don't have Open House in my district, so I usually don't get to meet the parents until Back to School night, which is sometime in September. I don't write a letter, mostly because many of my parents are illiterate in their own language, but I show a presentation at B2S night with LOTS of visuals. Our department holds meetings and events for the parents a few times a year so we get the chance to get to know them better during those times. I also meet them on the playground before and after school when they come to pick up their kids. I recently stumbled upon your blog and want to say Thank You for having such an awesome ESL blog! Although I believe our populations are similar, I work for a somewhat large district in Southeastern Washington. I serve only one school and although we have over 250 students qualified as ELLs, I only serve the newest students, all whom are refugees. I currently serve 36 students between 1st and 5th grades. I am wondering what your program at your school is like? It is very hard to help mainstream teachers accommodate for students, adjust my curriculum for incoming students, and prep for 3 para-educators that also work with me and my students. It sounds like you have your hand in many things in your district, do you have any suggestions for making time for all these things? Thanks so much for your kind words! Our program is almost completely pull-out; we only push in to kindergarten. For our newest newcomers, the intensity of our pull-out classes depends on language needs. Having 3 para's is AMAZING! I'd have them pull out your higher proficient students and work on shortening some of the gaps so that you can spend more dedicated time with your newest students. Email me at everyonedeservestolearn@gmail.com and I can try to help you more!